A group of youths hurled stones at police as they attended a suspicious collision in Harrogate yesterday (July 12). The 38-year-old victim was reportedly hit whilst on foot by a silver saloon car on a grassed area near a residential car park on Fairfax Avenue. In particular, we need to know about any sighting of a silver saloon car, possibly a Ford Mondeo, in the area at around 7pm on Sunday. He was taken by ambulance to Harrogate District Hospital where he received treatment overnight for broken ribs and bruising to his body. As police were carrying out house-to-house enquiries following the incident, a group of youths were seen throwing stones towards the officers. The youths were were moved on by police and no officers were injured and no damage was caused to the vehicles. Police have now launched an operation to investigate the collision and trace the vehicle, which failed to stop at the scene, the driver and any passengers. A silver Ford Mondeo was located in the Kenyon Road area of the town at 8.15pm. It was recovered by the police to assist the investigation. Efforts remain ongoing to find the occupants of the car involved in the incident. 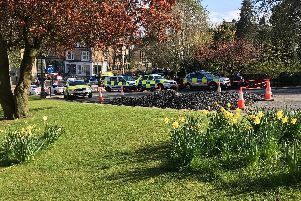 Detective Constable Richard Jones, of the Harrogate Serious Crime Team, said: “We are appealing for witnesses to the collision to come forward or anyone who has information that could assist the investigation into this serious incident. “In particular, we need to know about any sighting of a silver saloon car, possibly a Ford Mondeo, in the area at around 7pm on Sunday. If you can help, please call North Yorkshire Police on 101, select option 2, and ask for the Harrogate Serious Crime Team. Or call Crimestoppers anonymously on 0800 555111 quoting reference number 12150118820.